Welcome to Om Sai Enterprises. Manufacturer and Supplier of Disposable Medical Clothing. The company was established in the year 2012. Our products are applicable in Hospital, Clinic, Medical Colleges and other areas. Stringent quality products, immense domain expertise and variegated payment options make us the preferred supplier in the industry. We offer a wide array of Non Woven Shoe Covers, Loofah Sponges and Disposable Operation Kits. 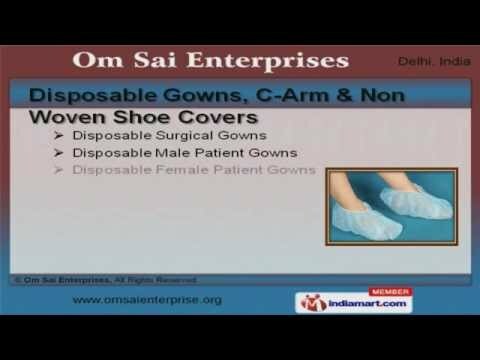 Our Disposable Gowns, C Arm and Non Woven Shoe Covers are extremely reliable. Disposable Bed Sheets, Aprons and Coats offered by us are widely acclaimed in the market. We also provide Disposable Surgical Instrument Covers and Spa Products that are in huge demand across the global markets. Disposable Caps, Towels, Masks and Slippers are in huge demand across the global markets. Our anization is highly involved in providing an impeccable range of Loofah Sponges and Disposable Operation Kits.